I still can't believe it. This was my 10th year attending the San Diego Comic-Con. 10 long years. I still remember that first year, back in 2006, finding myself overwhelmed by everything geeky and awesome. At the time we were barely a site, just a few months old, and yet somehow we found a way to get a press badge and sneak in. 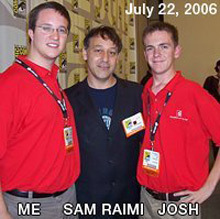 Not only that, but my main goal was to meet Sam Raimi as I was in love with his Spider-Man series (Spider-Man 2 is still one of my favorites). That year the big reveal was Venom in a never-before-seen tease of Raimi's Spider-Man 3, and I actually missed the panel because it was full (I couldn't get into Hall H easily back then either, go figure). But I stood near the doors and watched the footage as they were open (now they have giant curtains blocking the view). Hall H erupted in cheers. That excitement hasn't changed. This is the biggest version I could find. We even had polo shirts back then. I still smile looking back at this photo. And here I am now, 10 years later, still head-over-heels in love with Comic-Con. I can't help it. It's the geek mecca. I keep coming back because it keeps calling me back. The movies, the panels, the excitement, the people, the costumes, the showfloor, the stuff to buy, the reveals, the parties, the geeking out, the crazy hysteria. Yes, it has become horrible to camp out all night just to get into Hall H, and yes the footage often gets bootlegged and leaked online, but that doesn't affect my love for Comic-Con. It doesn't change the fact that this Con, in all its overcrowded glory, is one of the greatest places on Earth for geeks to come together and just be themselves. To geek out. To have fun. To revel in fandom. "I never got a chance to thank Gene Roddenberry for Uhura. I have to thank you for Zoe [Washburne, from Firefly/Serenity, played by Gina Torres]. She made me believe again that we were going to be out there—but not only that we were going to be out there, but we were going to be strong and beautiful. Thank you for that." That was the one moment that reminded me this is what Comic-Con is all about. Screw the lines, screw the crowds, screw the haters. This is a place where geeks can let it all out and not be bullied, but be cheered. Many of the fans who attend (making up the bulk of the 130,000+ attendees) are people from all over the world who save up to make this their one big trip all year. One woman in Hall H said she drove down all the way from Canada, my friend (who runs BadTaste.it) flew in from Italy. Sure, there's that desire to interact with your idols, but there's also that chance to "find your people" and make new friends, buy old comics or collect cool swag, to "discover your tribe". To let down your guard, let your geek out, and get your geek on. After 10 years of attending as a working member of the press, it might be expected that I've become tired of the same old shtick. The same booths, the same reveals, long days in Hall H, boring fan questions, boring panels. But I'm not tired of it. I'm not tired of it because it connects with me so deeply in a way that no other event does. Over the last 10 years I've been going to film festivals like Sundance, Cannes, Telluride; I've been on humongous movie sets for Watchmen, Man of Steel and Tron Legacy; at press junkets all over the world, and other conventions like CinemaCon. But the San Diego Comic-Con is unlike anything else out there. Despite a heaping of negative press this year, I'll still defend Comic-Con no matter what anyone says (though they really, really do need to figure out a solution for the obnoxious 1.5-mile-long Hall H line). I could've opted for one of those cheesy "what I've learned in 10 years of attending Comic-Con" clickbait-y articles looking back, but that's not me. I have lived this experience, it has shaped me in small and maybe big ways, it has been my annual place to travel to every July. My passionate thoughts flow ever more freely, and excitedly, after being at Comic-Con. I have a renewed sense of energy fueled by the exuberance echoing endlessly in the hallowed halls of the San Diego Convention Center. I'm reminded why I love being an unashamed fan, and why I love the way so many other fans express their effusive love, whether it be with costumes or quotes like the one above. I'm reminded why geeks are some of the best people on this planet. Over the years at Comic-Con I've seen it all, I've done everything. I made it into Entertainment Weekly party one year, the legendary "party of all parties" at Comic-Con. I have watched the rise of filmmakers like Zack Snyder, seeing him go from 300 to Watchmen to Man of Steel to Batman v Superman, presenting each one to louder cheers in Hall H each year. I have conducted interviews with big celebrities, and fellow geeks like Richard Taylor of Weta Workshop. We partnered with Bob Stencil (a comedian named Kyle Ray), a beloved face at the convention for years, to present his videos and integrate him further into Hollywood. I chased the Tron Legacy viral for three years at the Con before it opened in theaters. I was in Hall H when The Avengers were first revealed, when Loki took control of the audience, and when the Deadpool footage received a massive standing ovation (this year). Now it's all a part of history, it's all part of Comic-Con lore. I am so incredibly grateful, thankful, and honored to make it this far. To mark off 10 years at one of the most amazing places for geeks. Thank you for being a reader, thank you for following us all these years. I was obviously a geek before I went, but I have so much more respect for geeks, and I love every last one of them. My goal when I come to Comic-Con is not necessarily to make people feel jealous, but to make them feel like this is where they should be, make them feel like it's where they belong, too. I want them to realize that Comic-Con is a place where they'll be welcomed with open arms as a fellow geek, where they can cheer for their favorite celebrity, buy items with their favorite character on it, and make new friends along the way. At the end of it all, I suppose the greatest realization I've had is that - Comic-Con is no place for haters or cynics. It's a place for aficionados, for people who want to be hyped and revel in that feeling of excitement, and want to fall in love with stories and characters. It's a place where, even after waiting in line for 24 hours, you'll forget how bad it all was because right there in front of you is the person responsible making you believe in yourself. And that's worth everything. All these fond Comic-Con memories and moments, that make me smile so much thinking back on them, will be treasured forever as some of the most defining and thrilling experiences in my life. I wouldn't trade them for anything. Here's to 10 years at Comic-Con. This photo is from the Star Wars Concert at Comic-Con 2015 this year. I'm poking my head out in the back. Is that Ethan Anderton in Lussier's photo...miss you buddy! !~ // Congratulations, AB on another successful year of reporting from THE Comic Con! Happy tenth anniversary Alex, et al.